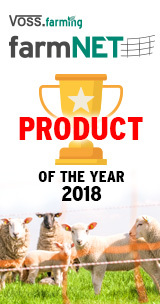 Poultry net, poultry fence, electrifiable nets of the highest quality - "Made in Germany"
It’s not just those who keep cows, horses, sheep or pigs, who should be concerned with secure fencing. Fences represent an important aspect of poultry farming too, and thus deserve more than just a fleeting thought. Pet fencing is not generally suitable for all cases. We recommend investing in a poultry fence which is specially designed for poultry farming and securely fulfils its purpose. Electric poultry netting is preferred by most as it’s more effective than electric fences for chickens etc. 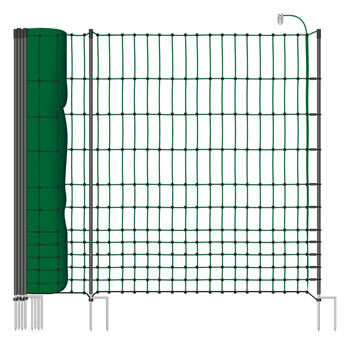 What types of fence and electric fence nets are available for poultry? Whether in the garden at home, on the farm, in a park or in an establishment devoted to safeguarding, protecting or breeding bird species, poultry nets are not just convenient but also provides the greatest advantages and highest levels of performance. So here is some background information and tips revolving around the subject of electric fences for poultry farming. How does an electric fence for poultry work? The principle is similar to that of electric fences and pet fences, however, this type of fence or netting is more geared towards birds where the details are concerned. A fence or net can either be used on its own to deter animals, or it can be used in combination with an electric shock. The animal receives a shock when it comes into contact with the net or fence. This is because, when it touches the conductor, it causes the electric circuit to close. At this point, an electric shock is released and the pulse lasts until the animal breaks the contact again – which it generally does immediately because it’s frightened and gets scared off. The electric shock is strong enough to pass through the feathers and reach the skin of the goose or chicken so that it can be clearly felt. This fleeting shock is not painful and after a while the creature “learns” that there is a deterring stimulus and no longer approaches the fencing. Some believe that it is inhumane to expose animals to electricity. They prefer to use poultry fences without electricity, however there is then the risk that the birds may escape through the fence. If they do escape or fall prey to wild animals, the damage caused will not just be of a financial nature. This explains why so many people prefer to use electric fences for keeping poultry. This avoids having to worry about the animals flying away or wild animals attacking geese, hens, etc. Electric fences for poultry farming deter cats, martens, dogs, raccoons, foxes and various other intruders while keeping your animals safely enclosed. Incidentally, electric poultry netting can be easily converted into pet fencing for cats and dogs / puppies or even into sheep or lamb netting. Poultry netting is made up of three main components which ensure that the fence works perfectly. If you opt for electrified poultry netting or pet fencing, the energiser plays the most important role. The energiser works with electricity. It is either connected to a source of electricity, i.e. to an external socket (230 V device) or it is powered by a battery unit. Battery devices with a power supply of 12 V are available in various designs. Contrary to common belief, energisers for poultry must also be able to deliver a medium to high strength of shock in the same way as sheep and horse fences. This is our experience as a professional electric fence manufacturer. This is because a weak electric shock would not generally be enough to deter feathered animals. Their feathers have an insulating effect and even their thin, horny legs impede conductivity. For long fences or large enclosures, it is important that poultry fence energisers can generate enough electricity to supply the entire fence system. A fence connector connects the poultry fence device to the poultry netting. If you opt for a poultry fence without electricity so that you just have a mechanical barrier, there is no need to purchase an energiser. This will save you money; however the all-important factor – safety – will suffer. Conductors are just as important as the source of electricity itself, as they conduct the electricity, transmitting it through the fence system or poultry net. Electric fence netting generally contains stainless steel wire in the form of horizontal polywire. Alternatively, on geese or chicken fences, rope or tape can be used, in theory, instead of polywire. Manufacturers tend to use conducting material such as copper wire. This is particularly effective in conducting electricity, but is not generally used on electric netting for poultry, which requires stronger wire. The conducting material on electric fences used for poultry farming must be properly connected and insulated so that no electricity is lost at any point along the fence. Standard connectors, wire clips and insulators are available for this purpose. These components are automatically integrated into the Electro-Net. 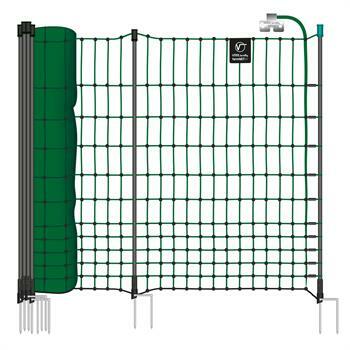 Various accessories are also available for combining several nets or, for example, for connecting a fence to a gate. An extra-narrow mesh width of less than 6 cm is available on premium products such as the Euro-Net, made in Germany, and, the mesh is even narrower in the top section. Without these components, an electric fence for geese or chickens would clearly be incomplete: Fence posts hold the barriers in place, and their significance should not be underestimated under any circumstances. With top-quality stakes and posts, you can be sure that poultry fences and netting will remain resistant and durable for many years. In most cases, posts for poultry netting and fences are not made of wood or metal as these materials must be specially treated to make them durable and hard-wearing. Instead, plastic posts have proven successful for electric netting. These robust posts for poultry fences are made with a single or double tip. They are driven into the ground, ensuring stability even in the long term. Quality products available from our online shop include tough and hard-wearing plastic posts with a double tip. Despite being exposed to harsh weather conditions every day, they do not suffer any damage. However, if you do need to replace a post, many sets include a replacement post in the scope of delivery. A repair kit and tensioning set is also included in the scope of delivery of branded goods made by reputable manufacturers such as the Euro-Net, made in Germany. It is preferable to use a poultry net rather than a electric poultry fence. They offer the decisive advantage of a narrow mesh net rather than rows of conductors. This means that it really is impossible for the chickens or geese to break through the fence. This kind of green garden fence is basically a net rather than a fence in the normal sense of the word. Small nets of 25 m in length are also available as are the more popular larger poultry netting of 50 m which are suitable for enclosing many animals or fencing a large plot of land. With its length of up to 50 metres, the fence netting can be used on its own or in combination with a garden fence. In virtually all cases, it is possible to electrify the poultry netting. This is ensured by the stainless steel wires which conduct electricity and are embedded into the mesh. Horizontal polywire conducts electricity whereas vertical polywire does not. Standard models have over ten vertical polywires, eleven of which can be electrified. The bottom ground wire does not conduct electricity as this would otherwise cause a short circuit (because it comes into contact with the ground and vegetation). The fact that it does not conduct electricity thus ensures additional safety. Popular electric netting has a height of 112 cm. 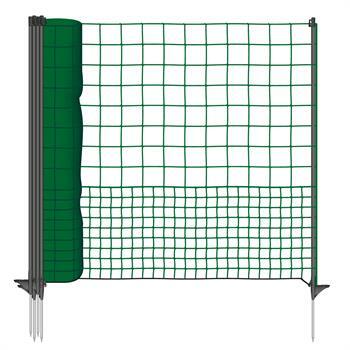 This net height of over one metre ensures that birds cannot fly over the poultry net. The number of plastic posts required depends on the length of the net. In total, 15 posts, each with a double tip, are built into high-quality 50 m poultry netting. Alternative models feature over 10 integrated posts or even up to 20 plastic posts. A ground stopper and head insulator complete the set. A green chicken fence blends seamlessly into the environment. Chicken nets which can be electrified as required and non-electrifiable green poultry netting are also available. 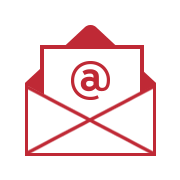 Solutions can be used on both a permanent and a mobile basis. The bottom section of the poultry net is made up of narrow mesh, preventing even chicks and small birds from slipping through. 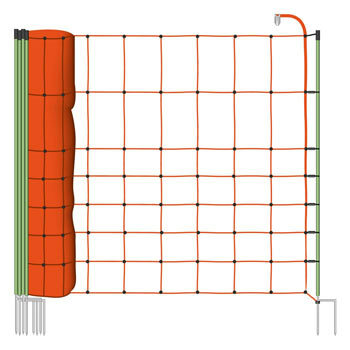 Electric netting combines a mechanical fence with an electric shock which reinforces the learning effect over time. In general, an electric shock is harmless for animals and simply creates an unpleasant sensation, preventing the poultry from escaping through the barrier. Even large areas can be quickly enclosed on either a permanent or a temporary basis. Welded points of intersection or seals over the mesh cross-points make the net even more secure. The fact that the green poultry netting is so easy to handle should not be underestimated. In just a few minutes, assembly is complete and the green poultry fence is ready for use. Having to carry out maintenance is the exception rather than the rule although the voltage in the fence or netting should, of course, be checked regularly with a fence tester. The principle behind the universally popular electric fence for poultry may sound complicated to non-professionals but the first impression is misleading. In reality, a few simple movements of the hand are all that are required to assemble and disassemble the Electro-Net. Firstly, unpack and unroll the net, holding the plastic posts in both hands. Then decide where you wish the fence system to start and install the first post upright in the ground. From the fixed starting point, gradually roll the entire net straight out, laying the posts out on the ground, one after the other. 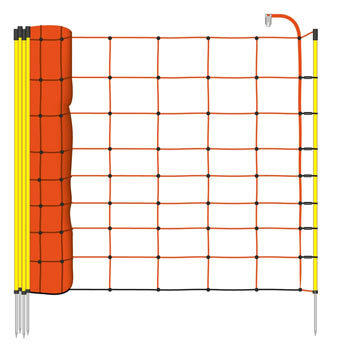 If you require a rectangular or square shape rather than a circle, it is a good idea to spread the electric poultry netting in a U-shape on the ground. When this is done, take the second plastic post after the starting post and place this in the ground too. Do the same with each post, and, keeping the net tightly stretched, drive the post as firmly as possible into the ground. If the ground is uneven, we also advise using connectors to fix the end of the net (as closely as possible) to the ground. If electric poultry nets are used, the final step involves attaching the energiser to the fence connector on the top polywire and setting it into operation. When disassembling the chicken net, also begin with the starting post. First, pull it out of the ground. 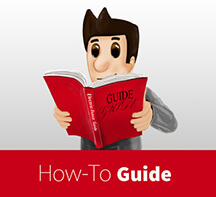 Then, remove one post after the next, holding them together with the starting post in the same hand. Then roll up the electric netting. The electric fence for poultry can thus be assembled and disassembled in no time at all and with a minimum amount of effort and knowledge. If you wish, you can use goose netting in combination with your garden fence or you can buy pegs and tension cables for a really firm grip. Poultry need to roam free or be kept in the open air. For this, it is essential to find the right enclosure which offers a combination of safety and ease of use. Electric poultry netting is the ideal choice as, together with the narrow mesh structure, the electric shock which is generated when the fence is contacted, prevents animals from escaping or protects them from wild animals. A green garden fence or electric netting in colours such as orange gives the chicken fence added value. It is ideal for use on a mobile basis and also offers a fantastic permanent solution. 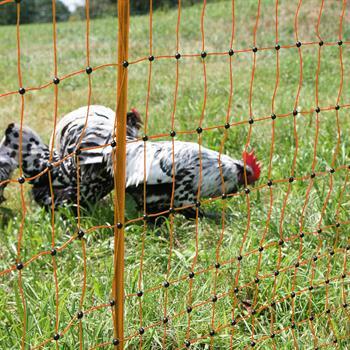 With a little prior knowledge, secure poultry nets can be purchased cheaply online.